Colombian politicians have given the media much to talk about in the last couple of weeks. 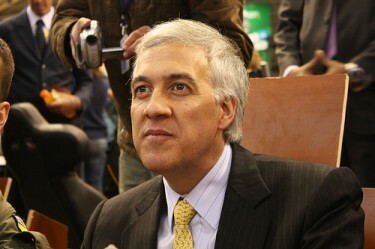 Aside from the uproar that Congressman Juan Manuel Corzo sparked over  his “fuel subsidy,” now Samuel Moreno Rojas, the former mayor of Bogotá who was banned from running for office  [es] as of May, has been sent to prison  [es] while facing accusations of embellishment, fraud, and extortion after some irregularities found in contracts for the third phase of Transmilenio, Bogotá’s bus rapid transit. While his trial on corruption charges is pending, President Juan Manuel Santos appointed Claudia López Obregón as mayor-in-charge until a new major is elected in October. It is not the first time the Morenos have been involved in political scandals. The mayor’s grandfather, Gustavo Rojas Pinilla, took over the presidency in the mid-50s through the only military coup in Colombia’s modern history and whose then-political party turned out to be one of the most fearful insurgent groups, the M-19, after losing the 1970 presidential bid. Today, Moreno’s brother, Ivan, is also facing charges  [es] under the contracting carousel, as well as his mother, Maria Eugenia “La Capitana” Rojas  [es]. The great strength that the Morenos attained at the onset of the Ernesto Samper administration, after 1994, started waning little by little. That’s how, as Alberto Donadio states in his book Uñilargo, the Gen. Gustavo Rojas Pinilla kept his power thanks to corruption, the same reason his grandchildren ended up in jail today. He affirmed that he only knows there’s an open investigation and ‘this is just the beginning.’ On the same subject, he affirmed to debunk all accusations Friday at the Attorney General’s office with documents, actions, and facts. I still believe Samuel is innocent and that he’s being framed. The NULE (brothers) are a handful of crooks who don’t want to return the money and paint themselves as good people. The attorney general is siding with them. What kind of interest lies there? La diferencia entre Samuel Moreno y @petrogustavo  es que el segundo tiene buenas intenciones.